Another week passed, another diy project! This is the latest of my recycled endeavours which I ended up finishing just after lunch, in time for promptly shooting. And no, I haven't had a haircut, just a lot of pins holding it in place under the hat! About a month ago we spent an afternoon sorting through lots of old photos from my childhood, when we finished sorting them there was a big pile of negatives left on the carpet. My mum was about to throw them out when I grabbed them off her and said I would use them for 'something creative.' I then fortuituously found a dress I didn't wear, and after a bit of thought started to pin the negatives on. Now this bit was quite tricky, and pretty tedious so it took several consecutive weekends to get the layers finished. The collar is just more negatives pinned in half and attached to the neckline. The whole idea I wanted to achieve was twenties 'flapper' look. Vintage inspiriation using modern recycled materials. I put it with a woollen knitted hat that was my great-grandma's and some thirties shoes (nearest time period I could get!) that were also hers. The long necklace is my mum's, and the little grey top underneath is thrifted. But thinking about negatives led me to thinking about negative views which tied in rather handily with an idea I'd already had for a debate. Recently I've been getting the feel that it seems to be much easier to criticise something rather than praise it. Look on any chat board or in any critic's guide and the ratio of positive reviews to negative seems to be rather skewed. I know that I am not a completely innocent party. I will criticise what I consider to be dubious fashion choices or music that I don't like, but I don't feel the need to express these views to the rest of the world. To me it seems sad that there are whole magazines and websites devoted to criticising 'celebs' and their choices in life, or actors/ directors/politicians/ designers/ artist/ authors. The list is endless. Is that a healthy thing to do, always pick fault with others? There is a difference between constructive criticism- which is galvanising for making change and learning, and simply revelling in the put down/ sarcasm, snide remark to bring down another individual. I am in no way suggesting that we should only ever say 'nice' things, but I am sometimes disheartened by the media's incessant need to relish in the belittling of others. It seems a strange thing to me, especially as I have recieved so much positive feedback and some truly wonderful comments in the blogging sphere. Or perhaps the kind of blogging world I'm engaged in is very different- seeking to celebrate rather than denigrate. Of course I understand that people all have their own views and opinions. But there is a difference between expressing a personal opinion and and actively seeking to put down others. I try to live by the mantra "Treat others as you would like to be treated yourself." And I guess I won't always manage that, but it seems like a good starting point. What is your view on this? Do you think that people are have a tendency to be overly critical or are they just voicing their own opinions? I would love to hear your reply to this question. I think it is often easier to criticize - liking things is so often easy and ordinary that it doesn't feel worth commenting on, like if you do you might just be another ignored voice in the chorus. And I think the more anonymous culture has made it easier for people to be that much more brutal, which is a shame and not something that's good for people, I think, in general. I feel almost like we might reach critical mass (so to speak) on this, where it eventually gets so bad that we have no choice but to start policing ourselves and others to be better people, where people just get TIRED of being so nasty - but who knows. Well, obviously I don't leave comments, but now I can't control myself :) It is really very great, very interesting and innovative idea. And the result is impressive. Also I like it because it looks like a very "wearable" item. I think that you are a creative person and a beautiful young lady, by the way. Love your blog! Love the dress another beautiful creation. I certainly agree with you on the whole negative portrayal of people especially in the media, the thing is, i think this sort of thing sells, as the average gossip magazine reader probably wants to read negative things about that A list star to make themselves feel better and the celebrity more real. I think the saddest type of negative people are - who only say negative things because they're insecure and need to bring other people down to feel better about themselves and jealous people who don't like others succeeding. I think some people are too afraid to be positive all of the time in fear that they'll be thought of as full of themselves. People now a days are too quick to judge others, they should spend less time criticising and more time fulfilling their goals and dreams. I Love how you styled It So You Look 20's Here - One of my favourite decades. Even your hair looks 20's! Have you seen the film Changeling? Other than being a wonderful film it also has great 20's costumes. Oh, I love the way you write bytheway! Your blog one of the few where I actually read the whole post. I've been wondering the same thing myself. The only answer I can come up with (or like, rather) is that the internet provides a level of anonymity. For the generations that grew up secretly watching the likes of the Jerry Springer show, suddenly the internet gives a place for people to have their '15 seconds of fame', even if it's at the expense of someone else. It's a perverse freedom. If Jane Doe writes a slanderous comment on Fashionista's blog, the origin is usually lost in cyberspace. If he/she doesn't put their real name, their true identity is unknown, therefore leaving them free to do whatever they please. I'd like to think that people would choose a more moral course of action, but from what I've been seeing on chatrooms, Youtube, and social networking sites, it seems to be quite the opposite. (I think, in a way, it's like stealing/petty thievery. People can get such a rush from the thought of taking something and not getting caught. In a way, it's like this. Someone is taking someone else's reputation, slandering them without getting caught. And in some cases, even be validated by other people. It's a sad case, really. So with that being said, I will go the opposite route and praise your blog for the good that it is. :) I just recently found it and have been enjoying it immensely. You have so much talent for one so young. I look forward to more of your shoots! loved the post. It's really crazy how many blogs there is to speak ill of celebrities and their choices. I agree with you, is much better follow positive things. I get bother in this kind of blog, cause I often don't see anything wrong with the choices criticized. Fashion should be a form of expression, freedom of feeling - that kind of criticism loose imposes silly rules and let some people afraid to dare, what i think that is a really bad thing. Sometimes I post a simple outfit and one more produced, to show that we all can look gorgeous watching the little details, but all without insults. isn't good demote anyone. I am very happy for your new conquest, congrats! The negatives dress is insanely wonderful and just so creative! I especially love the little strip around the collar, it's perfect. Your hair is lovely in this series of photos too, as it allows the negatives around the neckline be in full view; very clever! I like the transition between the photo negatives to the negative outlook/criticism. I have to agree that there is far too much criticism around and I don't think it's healthy for people to be shrouded by criticism and negativity; too much of it can be so damaging to one's morale. But at the same time, constructive criticism really helps some people grow. I've found that criticism also acts as a way for people to stand out and offer an adverse opinion, something different to the rest. I think that although the phrase "you should always treat others as you yourself would like to be treated" has clearly stood the test of time, I doubt many people put it into much use, especially in this day and age. Compliments and flattery is all very well, but a criticism will earn much more controversy, more of a reaction and that is perhaps what the instigators of the negative comments are looking for. Nevertheless, I feel that in some situations, "treat others how they treat you" is the most apt. Woo, a long comment, but thanks for bringing up such an interesting topic! Amidst all of the negativity, is a well-earned compliment for you, Roz. Once again, I commend you upon you and your blog! Oh i forgot to say! you made a great work with the dress. so cute 20's inspiration. I dont know how you ever thought of doing this but it is truly amazing and inspired! I love it! Another amazing result of your ingenuity! Love the dress, it is wounderful! The photos are great too. i don't quite know how to feel about this dress. as a fellow diy'er i'm impressed, but as a photographer who works primarily in film i think i'm slightly offended. what if something happened to your prints?? the negative are on a dress now so you can't make copies!! The aesthetic of that dress is lovely....just be sure to stay away from open flames! This is just so incredibly creative, I'm really amazed by it. i think in general it is easier to criticize something a lot of times than to praise it but i definitely find the blog world to be very different and supportive. come enter my v day giveaway! I definitely love that dress! I think it does have a very flapper-feel to it. It's just incredible how creative you are! And when it comes to criticism, I agree. Not that we can always be positive and nice, (I mean, there are times when we have to be honest), but sometimes it just seems a bit much. Some people can't seem to draw the line between honesty and disrespect. you brought the mood of the era very well! i especially adore how this outfit symbolize what i like about the era, the straight bodyline and films! wow i cant come to my senses on how you are mature beyond your years. you are 14 and have already slapped my level of maturity to outer space. First off, congradulations about having your blog in Fashionair. That is so amazing! Second, wow...what an inventive, fantastic and super fun idea with the skirt! Suer cool! Even though it may not be so practical, I love working on crafts and seeing other peoples creations! So congrats on the dress as well. I myself am working on a skirt, and so far so good. I will post about it on my blog! Critisism. It's tricky. Because I recently I have found that many students in my school can be very judgemental, and it is hard, because since it is such a common and simple thing to do (I mean judge and criticize) it say it is bad. But I like your comments. I have just started following your blog and really love what you are contributing to the blog community. I think your talent and eye for design and composition is fantastic and look forward to future posts. As for today's post...love it! I appreciate your thoughts on constructive criticism vs. excessive and hollow negativity. I have often had the same thoughts on the subject. Your "negative" dress is also really inspiring. Love the idea of design from recycled materials. Thanks so much for visiting my blog. Love your new post! The negatives have that 1920's fringe look for sure. Agreed....when it comes to being negative, I start to criticize other people only when there is something bothering me about myself. I think criticizing something is a defense mechanism used way too often to hide other problems. The problem is it is hard to avoid it. Absolutely love the outfit. Very creative. Thanks, for visiting my blog and commenting, very sweet of you! Keep up the great creative work. think you should try to treat people as you want to be treated. though that it is very hard sometimes! Roz, I applaud you! On both counts: the look/photos are gorgeous, brilliant, so creative. And then the 'editorial': I've thought about this subject pretty much every day since I started blogging last spring. Actually, sooner. I've thought about this all my life. My parents raised us with this same philosophy. That's probably why the kind of people who visit & comment on our blogs focus on the positive. I'm amazed at the negative rants on other blogs or sites, esp. if it's about celebrities, politicians, or other public figures. These people are still human beings. There's this feeling that if someone is 'successful', i.e., famous, they're fair game for attack. As if it's a small price to pay for what they get in return (i.e., money, and fame). Granted, they're probably too busy to actually read most of these things, but it's still so sad. It's all about envy, at core, and envy is such a poisonous substance. Even a lot of the big 'self style' blogs get that kind of negative feedback, small in proportion to the praise, but it's still there. Often it's thinly disguised as praise: 'I'm so jealous of your legs/shoes/hair/whatever' is meant to be a compliment, but it's a slippery slope. Especially since I'm posting shots mainly of other people - 'civilians', not celebrities (altho that could change) - I'm amazed that I've never once had to delete a comment because someone was hurtful about the person I posted. I'm assuming it's the same for you. I think that says volumes about our beliefs & attitudes, but also about the wonderfully positive people who support our (collective) blogs. I try to avoid negativity. I'm not perfect I can be critical too. Being around negativity is very toxic and draining. If I don't like something I just move on, I don't waste my time and energy dwelling on things I don't like. The dress is lovely! I especially like that the negatives have a tortoise-shell look to them at a glance. Are the skirt negatives strictly pinned, or did you sew them in place? I would love to see the whole thing in motion. The point you make about media criticism is spot on; I think it's just easier to point out other people's flaws, and it makes people feel bigger to put one another down, especially when that other is a celebrity who seems so have it all. I wonder if there's a way to change that? Oh goodness! Such insanely beautiful photographs! Wow! I agree with you - constructive criticism is good, but the internet often seems to be a place for people to let out negative energy on other people. Like you said, I'm sure the anonymous factor plays a huge role in people being a bit too harsh. I think it is more important to try to focus on the positive - there is too much conflict in the world as it is. 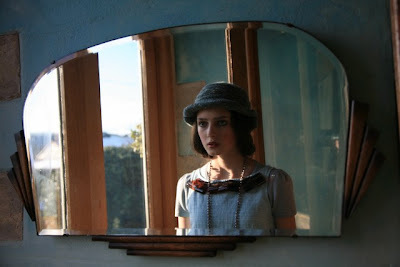 Oh, and I forgot to add that your outfit is so great - I love the twenties inspiration! thanks for inspiring, you look great! CREATIVE! haha i really like whaqt you did with the negatives, it looks so cool! plus good photography! great skirt. what a fun DIY project! these photographs are so pretty and creative - congrats - its well deserved! Omg what an inspired idea! I love the transient qualities of the negatives, and the way you incorporated flapper elements into the outfit. i love your blog to no end! you seem so professional. i wish i had the time/expertise to take such beautiful pictures but mine are all taken by me... on a timer. what camera do you use? the pictures are beautiful.